Career experts always stress the importance of quantifying results (numbers tell a story, right?) on your resume, but I’m in a field where results are often difficult and sometimes impossible to quantify (mental health counseling). For instance, how would you quantify the improved mental health of your clients? I suppose I can quantify my caseload, but that doesn’t necessarily suggest success. The resume advice I’ve come across seem to be more relevant for professions in which you can “increase productivity by %,” but I’m not sure that would be appropriate for my resume. At the same time, I want my resume to stand out and to communicate my specific contributions. What are other ways to do this? Thank you! Great question! I work in the counseling field, too, so I am familiar with the dilemma of trying to create metrics for accomplishments that involve a lot of subjectivity. Counseling shares this challenge with a lot of other fields such as human resource management and education. You already know that metrics are good for resume building, but they are also good for overall job security, too. In an organizational setting, the projects that receive ongoing funding and support are the ones that can prove effectiveness. In a private practice setting, you also want to be sure you are being as helpful as you can be to ensure ongoing work with satisfied clients and to increase the likelihood that they will refer others to you. The outcome measure you choose can be selected based on psychometric reliability and validity but also on face validity, ease of use, and affordability. There are two types of measurement that are common in counseling: treatment outcome and client satisfaction. In the treatment outcome arena, you measure reduction in symptoms or increase in well-being. In the client satisfaction arena, you measure things like the client’s satisfaction with the ease of scheduling an appointment, whether the client is pleased with the overall progress in treatment, and whether the client would return to work with you again or would recommend your work to others. 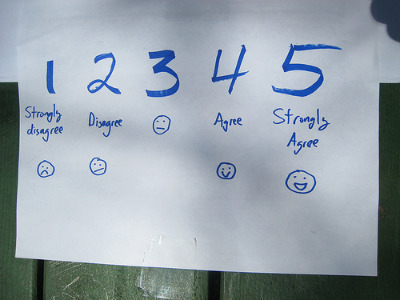 For example, you could use a Likert scale where “1” = “Strongly Disagree” and “5” = “Strongly Agree” for a question like, “I feel confident that my therapist understands the life challenges I describe to her.” If the average response is 4.8, you know you are doing something well!